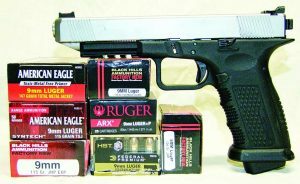 Lone Wolf Distributors “G34” Timberwolf with the factory test ammunition used for this article. The Timberwolf is match-grade accurate out of the box. In the world of firearms if you want to start a discussion that could rapidly degrade to argument, bring up the topic of 9mm versus 45ACP. 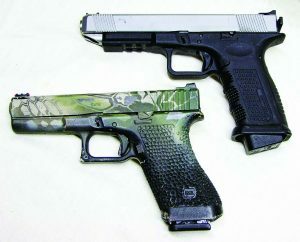 Another version of this is Glock versus 1911 and which is the better combat handgun. Personally I think both pistols are fine firearms and I shoot both regularly. What I do know is the 1911 can be built to fit smaller hands than a Glock, even the latest 4th generation of the Austrian pistol. Having a pistol that fits your hand is the key to shooting well and you cannot easily make a Glock fit like you can a 1911. Yes you can have the void in the frame filled and the frame size can then be reduced. This has three drawbacks: 1, it is expensive; 2. you have to wait for a “Glocksmith” to do the work, and 3. the reduction can void the warranty. Not many folks want to do that, so what do you do if you want a smaller Glock? The best solution I have found is to contact Lone Wolf Distributors (WD—Phone: 208-448-0600; Online: lonewolfdist.com) and have them build you a Timberwolf. LWD’s Timberwolf is a polymer frame that can replace your Glock frame on any of the sizes or calibers of Glocks. What is radically different is the Timberwolf is the size of the grip. It is much smaller in diameter and the interchangeable back strap makes the pistol fit more like a 1911 or a very thin Glock. Even though the grip size is smaller, the Timberwolf will fit most holsters for its Austrian sibling. Once you get past the smaller grip you will notice the nicely checkered frame. This frame feels like nicely checkered steel without the sharp edges. It does not have that “it’s a plastic gun feel,” which is really a nice change. I have a couple thousand rounds through my Timberwolf and have not had the thought, it needs to be textured. LWD did a good job giving the Timberwolf the right feel. You can see the excellent molded checkering that gives good purchase in the wettest conditions and the scalloped trigger guard. The most obvious features of the Timberwolf are the factory-installed mag well and the metal trigger. 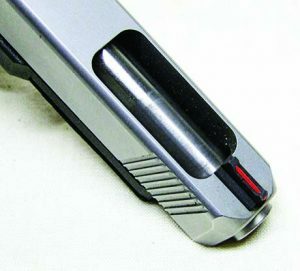 The magwell just looks good and it does help facilitate smooth magazine changes. The metal trigger completes that feel of the pistol. No matter what the quality or who makes it a polymer trigger just feels different; because you know it is polymer. Tech gurus tell me metal triggers in polymer pistols do indeed aid in making the trigger feel/break more like a 1911. I will not argue with them; I just like the look of the aluminum trigger, it is cool. LWD molds a nice beavertail into the Timberwolf. While none of my Glocks have even given what many of us older folks refer to as a Walther PPK grip; I do know guys with big hands that have had it happen. Oh, I guess I should tell those who don’t know…Walther PPKs because of their small size are known to abrade your shooting hand with the rails during cycling; later models of the PPK and PPKS all have beavertails to help prevent this. Where you will appreciate the beavertail is shooting 10mm and .357Sig versions of the Timberwolf. 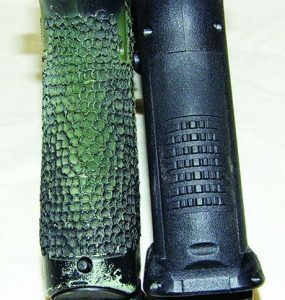 It helps to control the recoil and reduce muzzle rise. Unlike the original polymer pistol; you can buy strippled Timberwolf frames, complete frames and even complete Timberwolfs. All of the frames and slides will take OEM and aftermarket Glock parts. I have swapped out my G17 slide and my custom race Glock upper that LWD built a few years ago onto my Timberwolf without any issues. You will never know the swap occurred other than the pistol will be smaller. Lone Wolf lightens the slide to properly balance the pistol, you can also see the Dawson Precision sight that was installed to correct my POA/POI impact issues. When I contacted LWD, I had them build me a Timberwolf in a G34 configuration. 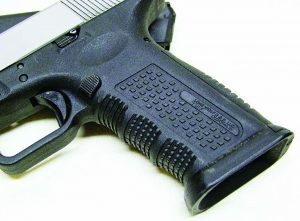 I wanted a five-inch “Glock” and I wanted the smaller grip to allow smaller statured shooters to learn how to shoot with a reliable, comfortable to shoot 9mm. The Timberwolf was built with all LWD parts, including their barrel and fire control parts. Out of the box the trigger was crisp, breaking at four pounds-ish, thanks to the 3.5lbs LWD connector and LWD trigger. Like its Austrian cousin the Timberwolf was 100% reliable with any and all ammunition I ran through it. I had LWD install 10-8 Performance (Online: 10-8performance.com) sights when they shipped the pistol. I like the “U” notch of these sights because they are accurate and fast. This is the first pistol that this system let me down; with the prescribed front/rear combination the pistol was hitting four to six inches high at 25 yards. Even installing a higher Dawson Precision (Phone: 866-300-1911; Online: dawsonprecision.com) front sight did not correct the issue. What finally corrected the POA/POI issue was installing a Heinie (Phone: 217-228-9500; Online: heinie.com) rear sight with the Dawson front sight. Now the Timberwolf is a tack driver for me. Once the sight issue was solved it was time to get to the range with ammunition from Black Hills (Phone: 605-348-5150; Online: black-hills.com), Federal (Phone: 800-379-1732; Online federalpremium.com) and Ruger’s 80-grain ARX (Phone: 912-988-3019; Online: ruger.com). From Black Hills I had three loads; their time-proven accurate124-grain hollowpoint, 115-grain full metal jacket and 115-grain EXP. The three Federal loads I shot were the 147-grain total metal jacket and two new loads: the 150-grain HST and 115-grain TSJ-Syntech. This selection of ammunition was chosen to cover training and range use. These loads varied from hot +P loads; the Black Hills EXP and Ruger ARX to the subsonic HST to one of the newest training rounds on the market, the Syntech. You can see the difference in the thickness of an older, well-traveled G17 and LWD’s Timberwolf which thanks to the interchangeable back strap will fit smaller hands. As with any handgun, I ran several magazines through the Timberwolf to test its feeding, extracting and general performance with a mixed bag of ammunition. Most of this was fired adjusting the POA/POI issues and getting the proper height front sight. The only issues I had came with some reloads with lead bullets. They were sluggish feeding, which I think was due to lube being soft in the summer sauna. When I got serious about shooting for accuracy, I was surprised the most accurate load when I shot the Timberwolf for accuracy was the Ruger ARX. At 25 yards it averaged sub two inches for five shots. The other six loads all averaged two and half inches to three inches for five shots. Every load had three shots in each of the four five-shot groups touching. Realistically, the Timberwolf is wicked accurate. Much of the accuracy can be attributed to LWD’s stainless barrels that are match grade accurate. The softest shooting load was the 150-grain HST while the 115-grain EXP had the most recoil. The EXP was far from what I would refer to as unmanageable; the recoil was just more pronounced. Black Hills’ 124-grain hollow point load uses Hornady’s XTP bullet. This cartridge expands reliably with a proven performance record for expansion and accuracy. I carry this load in my CCW pistol for this reason. You can see how sleek the Timberwolf is when compared to my 20-year-old G17. Federal’s HST line has been receiving favorable reviews for penetration, weight retention, accuracy and consistent expansion. The HST hollowpoint has been designed to expand reliably when passing through light or heavy fabric. Federal’s 147-grain Hyrda Shok performed well on the street; I am sure the 150 grain HST will as well. Unlike the Hydra Shok the HST is a subsonic, yet gives better expansion and penetration because of the bullet’s engineering. Having carried Hydra Shoks in the past, I would confidently carry the HST as well. The round folks have been telling me I need to shoot is Federal’s 115-grain TSJ, Syntech. This load uses a lead-free primer making it “safer” by reducing lead exposure and safer because there is no jacket to ricochet off of hard objects. The synthetic red jacket will also reduce drag and fouling of the barrel, making it easier to clean your handgun. I found this to be an accurate cartridge and would use it for competition anytime, anyplace. The Timberwolf ate this round like it was a ham sandwich after a long day working. I also fired it through several other pistols including a couple 1911s and the pistols never missed a beat. When it comes to ammunition today, you will find if you stick with reputable manufactures; most ammunition/handgun combinations will outperform most shooter’s abilities. 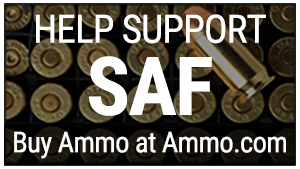 After several decades self-defense/duty ammunition will perform provided the shooter places shot accurately. I would personally feel safe with the four self-defense loads we tested in the Timbewolf. Overall Lone Wolf Distributors’ Timberwolf is a helluva pistol. While if fits Glock holsters, slides and uses Glock parts it is not one. It is a Timberwolf built with American parts with a smaller grip size, different grip angle, and better checkering, nice mag well and it can be built to your specifications. When I say you can have one built to your specifications, I mean it. You can have mini-red dots low mounted, slides milled, have your favorite caliber in your favorite size (within reason) have several different slides for your Timberwolf and all will fit and shoot accurately. Timberwolf is slowly approaching that magical “500” number so the pistol will be USPSA Limited and IDPA ESP/CDP legal. If you are looking for a quality pistol, LWD’s Timberwolf is worthy of serious consideration. 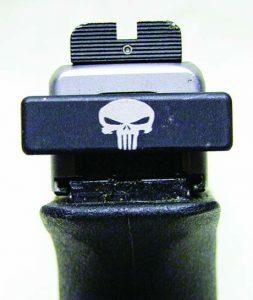 This shot shows a Punisher emblazoned TacRack on the Timberwolf and the old Heinie Straight 8 rear sight that I installed on this pistol. Once you get your Timberwolf, install a Wright Shooting’s (Phone: 757-725-1717; Online: wrightshooting.com) TacRack. This small tool replaces the striker/firing pin cover to give you a place to really get a grip on your Timberwolf, M&P, XD/XDm, and compact versions of these pistols. I have been using TacRacks for a few years now and find them to be well worth the price. Not only does it give you a more solid grip when racking the slide, but it can be a huge help when you have to clear a serious jam. 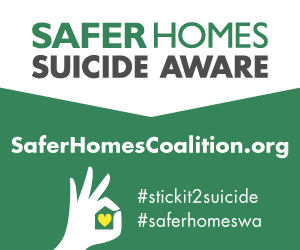 You will find the hook design of the TacRack aids a single handed clearance drill. If you have a mini red-dot mounted, a TacRack makes loading, unloading and keeping your pistol running so much easier. This is a piece of kit built by Smith & Wesson’s Brandon Wright who came up with the idea of the TacRack when he was still an instructor at G4S ITI. Not only is Brandon a world class action pistol shooter but he was a VA State Policeman, VA POST Instructor and Smith & Wesson rep. Unlike many gizmos, TacRacks were designed to help you keep your pistol in the game/fight. For $29.99; try one, you will not be disappointed. Another piece of kit that shooters will find helpful is Notch Gear’s (Phone: Online: notchgear.com) hats. How can a hat be helpful you ask? Notch Gear hats are helpful because they fit your shooting glasses. Because most shooting glasses we wear on the range are wrap-around style and hats do not generally come down to your glasses without there being a big gap or without the pressure giving you a headache. If you are looking for hats that will fit around your shooting glasses, Notch Gear’s Adjustable Operators are the answer. You can see the “Notch” in the brim that worked well with several pairs of shooting glasses. Notch Gear has solved this issue with the notched out brim on their hats. How dare they defy tradition and deface a cap. Its unAmerican to scar this American icon. Rest assured; Notch Gear improved hats for shooters. You will have less of that under the brim glare, your Notch Gear will fit into your glasses to reduce headaches caused by your hat forcing the nose piece down into you’re the bridge of your nose. 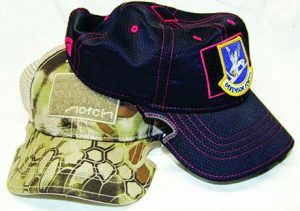 Notch Gear offers several styles of hats from camouflage hats to solid color, fitted or adjustable; whatever fits your style. I chose adjustable Operator hats. One is the Athlete black with red stitching and another in Kryptek Highlander because my competition shirts are Kryptek camo. I found these hats fit my Rudy Project or ESS shooting glasses. Since they do not have that annoying top of the hat button, your shooter’s muff will not be attempting to bury the button into your head. Again this reduces the odds of your hat causing a head ache. Hopefully the first article of 2017 will get you in the mood to head out to the range sporting a Notch Gear hat while shooting your new TacRack- equipped LWD Timberwolf. If the winter weather is nasty, stay in and stay safe because better weather will be coming. Should you venture out; shoot safe, shoot straight and have fun.